– Creating WiX project in Visual Studio. 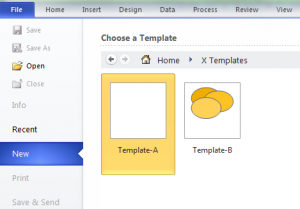 – Adding Visio template and stencil files to the project. So what does the Solution Publishing Tool actually do with the installer? It fills in the “PublishComponent” WindowsInstaller table, and adds trigger action for Visio to rebuild template cache by modifying ConfigChangeID registry key. You can find detailed information about the table in this Microsoft KB832029 and in this article. Since Visual Studio installation project is rather limited tool in fact, and does not support anything unusual like component publishing, this gap is was filled with this Solution Publishing Tool. WiX does not impose any restrictions and provides full access to all features Windows Installer supports. Means, you can author these Visio publishing rules directly in installer, without need for the Solution Publishing Tool, which means that your project can be built from ground up in Visual Studio, or from command line. Including, in particular, even Microsoft TFS online (which unexpectedly supports WiX builds). Adding Visio publishing information to WiX installer. This example above publishes an English stencil (id = guid of stencil, see below), named “StencilA.vss”, which should be made available under category “X Stencils” as “Stencil-A”. Qualifier LocaleID\FileName 1033\flowchart.vstNote You cannot use multiples of the same file name in one Visio environment. Locale-ID\FileNamemust be unique so that Visio can recognize it. Therefore, use a unique file name in one Visio environment. ComponentID A predefined value for the content type. MenuPath For templates, the Menu-Path specifies where the template is displayed in the templates menu tree and in the Choose Drawing Type task pane. For stencils, the Menu-Path specifies where the stencil is displayed in the stencils menu tree. If this value is an empty string, the template or stencil is not displayed in the menus. If an underscore character (_) comes before any name in the menu path, the template is not displayed in the menus.The last portion of the menu path is also used in the file name in the Visio user interface. For templates, the file name is displayed in the most-recently used templates list. For stencils, the file name is displayed in the title bar of the stencil. Flowchart\Work Flow Diagram Shapes. Triggering Visio rebuild template cache. If Err = 0 Then WshShell.RegWrite Key, visChangeId + 1, "REG_DWORD"
If Err = 0 Then WshShell.RegWrite key, visChangeId+1, "REG_DWORD"
– Implement a custom action which does that without scripting (see sample solution for implementation details). The solutions should build an installer (x86 or x64 version depending on the selected configuration) which installs a pair of templates and a pair of stencils in English and German. The installer should install stencils under category “X Stencils” and the templates under category “X Templates”. Should work with All Visio versions (2003 – 2013).